November 16, 2016 – A newly discovered “great valley” in the southern hemisphere of Mercury provides more evidence that the small planet closest to the sun is shrinking. Scientists used stereo images from NASA’s MESSENGER spacecraft to create a high-resolution topo map that revealed the broad valley — more than 620 miles (1,000 kilometers) long — extending into the Rembrandt basin, one of the largest and youngest impact basins on Mercury. About 250 miles (400 kilometers) wide and 2 miles (3 kilometers) deep, Mercury’s great valley is smaller than Mars’ Valles Marineris, but larger than North America’s Grand Canyon and wider and deeper than the Great Rift Valley in East Africa. “Unlike Earth’s Great Rift Valley, Mercury’s great valley is not caused by the pulling apart of lithospheric plates due to plate tectonics; it is the result of the global contraction of a shrinking one-plate planet,” said Tom Watters, senior scientist at the Smithsonian National Air and Space Museum. Watters is the lead author of a paper published in Geophysical Research Letters using images from NASA’s MErcury Surface, Space ENvironment, GEochemistry and Ranging (MESSENGER) spacecraft during the orbital phase of its mission. Mercury’s great valley is bound by two large fault scarps—cliff-like landforms that resemble stair steps. 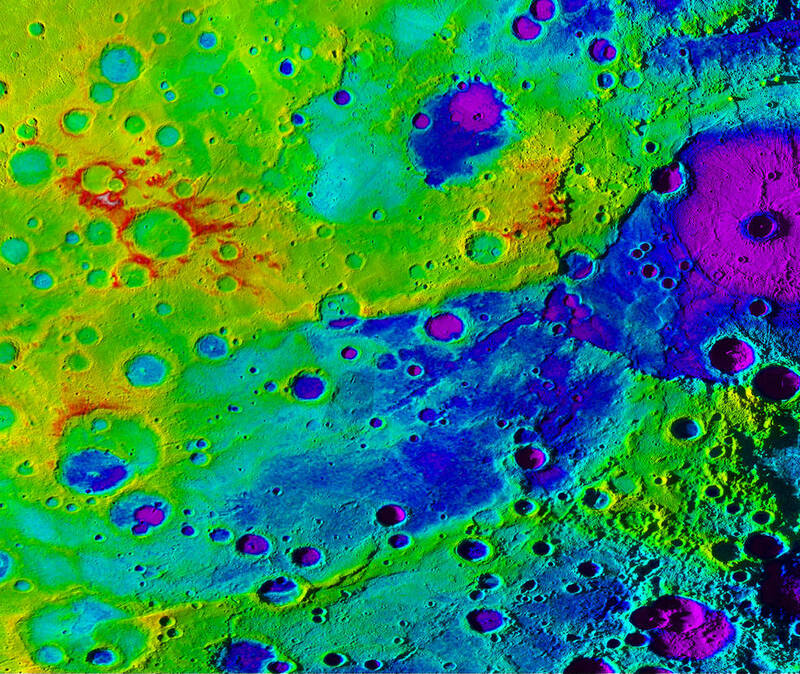 The scarps formed as Mercury’s interior cooled; the planet’s shrinking was accommodated by the crustal rocks being pushed together, thrusting them upward along fault lines. However, the valley is not only the product of two large, parallel, fault scarps—the elevation of the valley floor is below that of the surrounding terrain, suggesting that another process may be at work. The most likely explanation for Mercury’s great valley is long-wavelength buckling of the planet’s outermost shell in response to global contraction or shrinking. Cooling of Mercury’s interior caused the planet’s single outer crust plate to contract and bend. Crustal rocks were thrust upward while the emerging valley floor sagged downward. The sagging valley floor lowered part of the rim of the Rembrandt basin as well. “There are similar examples of this on Earth involving both oceanic and continental plates, but this may be the first evidence of this geological process on Mercury,” Watters said.